They say you shouldn’t go back to old loves – August Beer Club “B” in Hiroo was mine and I regret going back to the chain with this branch. August Beer Lab Kitchen is located a bit far from anywhere in the area, and the beers on tap are expensive for what you get. Plus the whole place is smoking too – something I perhaps forgot about due to all the cheap ¥500 beers I used to consume at the Hiroo location. At least the prices include tax and there is no table charge but it’s hard to recommend August Beer Lab Kitchen over the other places in the area that are closer to the stations. After the August Beer Club “B” in Hiroo and August Beer Club in Roppongi locations both closed down over the last couple of years, I was at a loss for some cheap happy hour beers with a 7% kick. Luckily other places have opened up since then but to this day, August Beer has always held a special place in my heart. Cheap craft beer with some cheap chips to boot. When August Beer Lab Kitchen came up on my radar, I was surprised to find out that it’s been open since July 2011 – what?! Why had noone told me about this place? August Beer Lab Kitchen is located in a weird area that is barren of anything besides roads and random shops. It’s a few minutes walk from Shin-Nihonbashi station and a few minutes more from Kanda station – though it does involve a bit of walking around the houses, so to speak. There is space for about 30 people inside – all seated around tables with no counter seats. Thankfully, there is no table charge but August Beer Lab Kitchen is fully smoking – something that I had forgotten about since my last visit to one of these places. Moreover, none of the menus were in English either. I didn’t notice any wifi either. Without wanting to rehash the August Beer Club ‘B’ Hiroo review, the beers on tap at August Beer Lab Kitchen are generally the same along with prices. The drinks come in two different sizes – glass (230ml) for ¥580 and pints (470ml) for ¥950 and all prices include tax. There are only August Beer Club beers on tap here so don’t expect anything different as the lineup doesn’t change – at all! Perhaps my drinking hazy memory had blurred out the servings as the beers that I had came up with a fair sized head on tap – even asking for a thin head on top. 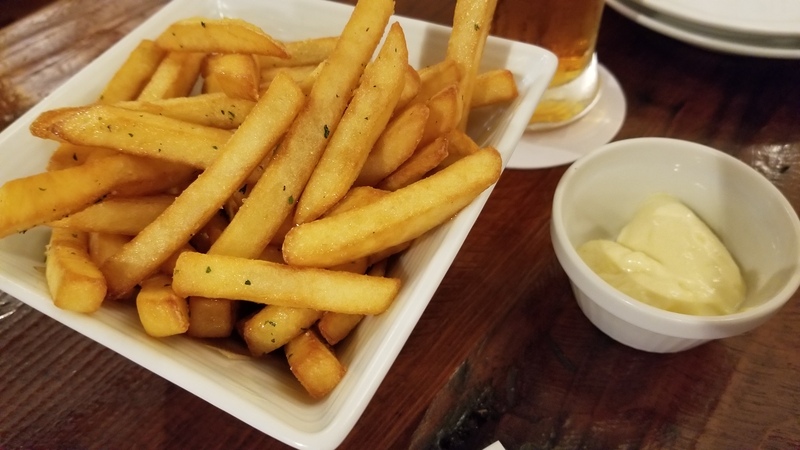 The food at August Beer Lab Kitchen is basically the same as the old Hiroo branch but the chips remain! The double fried Belgian fries – once in oil and then again in butter – are too hard to resist. And with all the walking you have to do around the area, the chips help keep the energy up! There weren’t many options for vegetarians however, besides some small appetizers, so be warned! The closest station to August Beer Lab Kitchen is Shin-Nihonbashi on the Sōbu Line (Rapid). It’s about a three minute walk. August Beer Lab Kitchen can also be reached from Kodemmachō Station on the Tokyo Metro Hibiya Line.